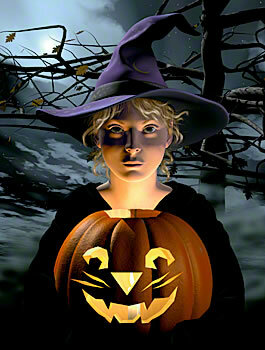 A Halloween piece, completed in October of 2003, originally for the October page of the Computer Art Calendar I did that year. Since there was almost no time before Halloween, I took it down right afterwards. But we had a few copies, so I took them to shows, and people liked it. So I decided to leave it up! Done with Lightwave 7.5®, using a Vue 4 sky, and retouched a tiny bit in Adobe® Photoshop® (mostly for the hair and ground fog.) This time, I made all of my own models, including the girl. This print is now available only from my Zazzle store. (The signed prints have been sold out.) Prints from Zazzle aren't signed, but you can choose any size you want, printed on any of the various Zazzle papers (from cardstock to canvas.) Prints come without a frame or mat, but you can have them framed if you want to. So, go to the Boo! print in the Zazzle store.